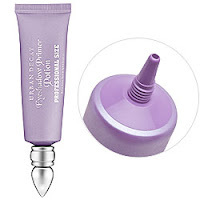 Beauty Blog: New Packaging for Urban Decay Primer Potion! New Packaging for Urban Decay Primer Potion! It seems as if Urban Decay has listened to all of its loyal fans and taken our requests into consideration! I know we all thought the original "genie bottle" was very cute, but it was such a waste of product. Urban Decay has just released a new Eyeshadow Primer Potion in a Professional size at Sephora. This is a new very user friendly squeeze tube! It retails for $29, but it comes with 0.85 oz of product. The original size primer potion only had 0.34 oz and the XL size had 0.55 oz. So this release is truly a professional size bottle! And you can actually get all of the product out of this tube! The only downside, its that is it marked as limited edition!?! Huh? I have heard that they will be releasing a smaller size in the same tube design in their fall line, so let's hope so. I think it would be a bad decision on there part to only release this packaging for a limited time! If you want to purchase this product, head on over to Sephora and take a look!